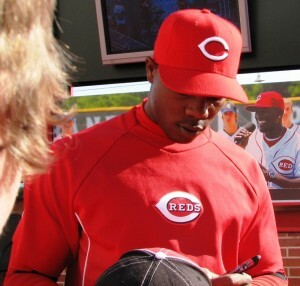 Aroldis Chapman signing on Opening Night 2012. The news we were expecting came today, and it’s what I’d feared, the Cincinnati Reds are not the forward-thinking organization that statistics-aware fans wish they were. Instead of seeing if they’re $30 million investment could become a great starter–what they initially scouted him for–the Reds bowed to the whims of manager Dusty Baker and made Aroldis Chapman the closer. “We made a decision on our rotation. 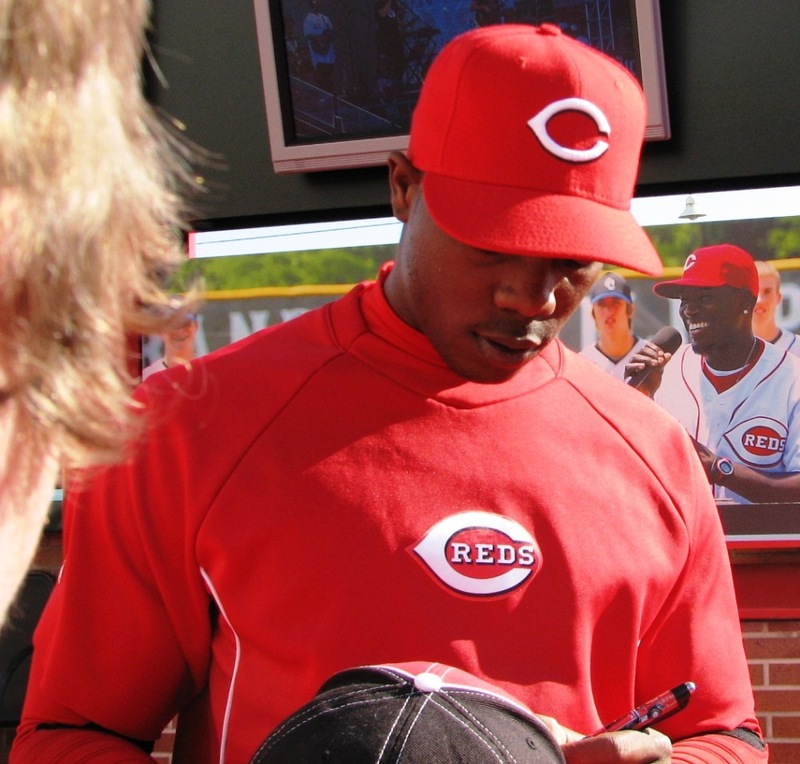 It’s Cueto, Latos, Bronson, Homer Bailey and Leake,” Reds manager Dusty Baker said. I’m not that upset about this. 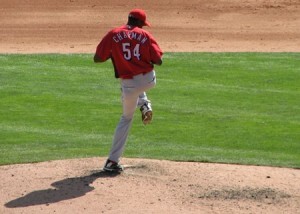 Chapman is very good as the closer. And now there’ll be Jonathan Broxton to help when Chapman cannot pitch a second or third day in a row. I’m just a little disappointed. I really wanted to see what Chapman could do as a starter. I mean, the list of tall, flame-throwing left-handed starters isn’t long, kind of starting and ending with Randy Johnson. And Chapman could’ve added his name, but the Reds were apparently too scared to upset their manager and their player to find out. But this isn’t bad news. At least, not for this season. 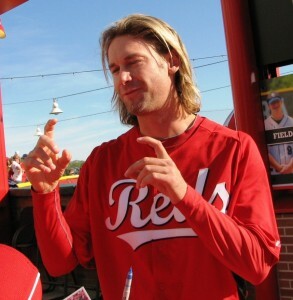 The Reds already had an awesome rotation in Johnny Cueto, Mat Latos, Homer Bailey, Bronson Arroyo, and Mike Leake. And the bullpen is a very stacked place. The 2013 season is looking very bright. Still, it sure would’ve been nice for the team to find out what they had in Aroldis Chapman. It appears that the Reds’ offense has woken up for the season. I say that just because the Reds have scored 46 runs in their last six games. The 9 they added to that total last night against the A’s, though, still weren’t enough due to the giving up of 10 runs. The pitchers may still be a little groggy yet. Johnny Cueto had a rough time of it. He gave up 5 runs (earned) on 5 hits and 2 walks in just 1.2 innings of work. Nick Christiani gave up the next 2 runs in the following 1.1 innings. By this point, Logan Ondrusek’s 1 run allowed in 1.0 innings must have looked pretty good. Wilkin De La Rosa was the unlucky one to get credit for the final 2 runs, including the game winner in the bottom of the ninth. Despite all the runs, no one really stands out offensively, thanks to the fact that 25 different guys took the field for the Reds in yesterday’s game. Zack Cozart did go 3-for-3 with a run scored and an RBI. Joey Votto went 1-for-2 with a walk and a run scored. His .394 spring training batting average is gaudy. Today the Reds visit the Dodgers at 4:05 p.m. Mike Leake is starting and Aroldis Chapman is also scheduled to take the mound later in the game. Everyone will be scrutinizing the nature of Chapman’s contribution to try to get a hint at which of these two guys is going to get that fifth rotation spot. I bet crappy headlines like that got used all the time while Prior was pitching for Chicago. Mark Prior pitched an inning for the Reds yesterday. He was the only one of the seven pitcher who didn’t allow so much as a hit. Prior is the Benjamin Button of baseball players, breaking into the majors in his first season after being drafted at age 21. He pitched 167 innings his first year and 211 his second year with the Cubs, where our own Dusty Baker was managing at the time. 2006 was the last year for both of them in Chicago, and Prior has been in the minors ever since. Baker took a lot of flak for the breaking of Prior, but it was in the larger context of Cubs dysfunction. The Reds have a whole group of experts deciding how many innings guys should pitch these days. It takes a village, guys. Anyway, it sounds like they might be bringing Prior up at some point this season. I hope it works out really well for him. I have to admire a guy who’s still willing to go pay his dues in the minors for all those years. Nick Cafardo at the Boston Globe ranked Dusty Baker as the 12th best manager in the game going into this season. I’d link to it, but it’s behind a paywall and I’m not shelling out $.99 for 4 weeks of access to Boston-area news. You can read about it how I did, though, via the gently dissenting opinion at Firebrand of the American League.